Today, let’s learn how to have a powerful backhand attack like a pro. 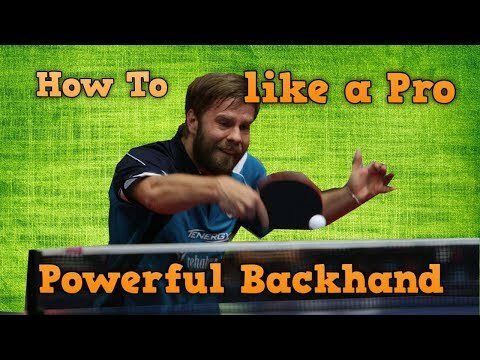 If you have chosen the right backhand rubber, then you should learn the best backhand technique to attack in table tennis. Backhand is very important nowadays. We focus on the powerful backhand topspin with Jon Persson. Many players don’t know how to attack strongly by using the backhand. The mechanism of the backhand stroke is different than the forehand technique. I have explained the powerful forehand topspin with the Chinese technique. For the forehand, you can rotate your whole body, and then have a stronger force. While for the backhand, you hit the ball in front of your body. So it’s not easy to generate a lot of force with the backhand. Does the power come from the wrist? the elbow? or the shoulder? Let’s learn from Jon Persson (Swedish Pro players, actually play in Pro A in France). Let learn how to generate a powerful backhand attack. Here are 3 steps of the powerful backhand attack. The first step, you should “drop” your racket down. Drop your shoulder very low. Many players just stand high, and forget to do this important step. That’s why they can’t generate enough force. You should also close your racket, and fold your wrist. The main force comes from your shoulder and your elbow. After folding your elbow, dropping your shoulder and your racket, now you will generate a lot of force. Hit forward! Don’t hit upward! Release the elbow and hit forward. Many players just try to hit upward, this will reduce the power and the consistency of your shots. And finally, at the moment of contact, you should use your wrist. Release all of the power generated at this moment. Power is from the solid foundation from the ground, transferred to the whole body, to the shoulder, to the elbow, and then using the wrist to “accelerate” into the ball. Keep your wrist straight at the last moment. Now let’s see the real speed of this backhand. center of gravity is in general at your hip, where you rotate your whole body. yes, I will make a tutorial the BH of Hugo. Thank you now i understand. Your videos are awesome. They are of great help especially to ‘nobody’like me who started to love the game. These exciting raffle of yours mean so much to me. Your gifts would be of help not just to me but to our athletes who can’t afford to buy one. Looking forward to a pair of blade and rubber from you.. Thank you and more power! I'm a huge fan of your videos and blog. Thank you SOOOOOOO Much! You now have given me a lot of confidence to stop EJ'ng with blades and just practice practice practice!